Calcineurin signaling is increased in α-actinin-3–deficient muscles. 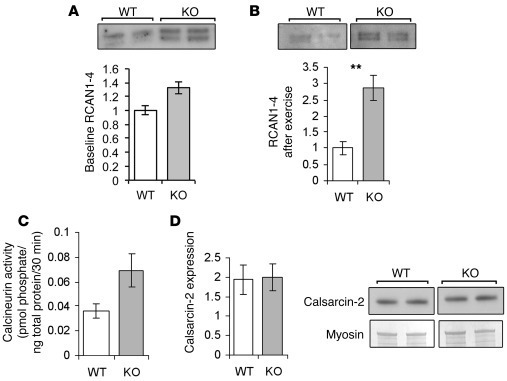 (A) Muscles of KO mice on a C57BL/6J background showed a 1.3-fold increase in RCAN1-4 protein expression compared with WT muscles, suggesting increased calcineurin activity (P = 0.057; n = 3–4 for both groups). (B) In exercised mice on a 129 background, RCAN1-4 was 2.9-fold upregulated in the KO group (P = 0.004; n = 6 for both groups). (C) Direct assays of calcineurin activity confirmed a 1.9-fold increase in calcineurin signaling in exercised KO muscles (P = 0.093; n = 6 for both groups). (D) Calsarcin-2 expression was similar between WT and KO muscles (mean ± SEM; **P < 0.01, Mann-Whitney U test). In B and D, the lanes were run on the same gel but were noncontiguous.